What’s the best possible English Channel record? Trent Grimsey’s Channel record again raises the question: What’s the best possible English Channel record time? 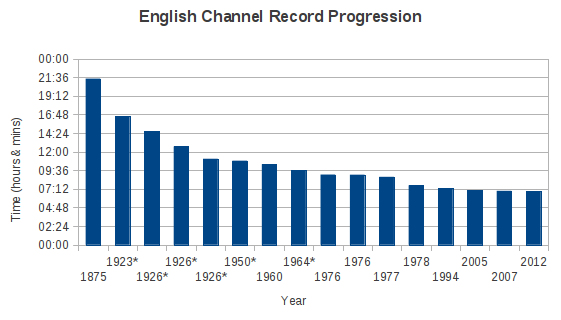 Here’s the English Channel record progression charted. No good record list is complete without an asterisk. In this case the asterisked years are France to England (F-E) swims. The records are gender independent as three women set the record. As any reading of Channel swimming will tell you, the original England to France direction (now the only direction available unless doing a two-way) is considered tougher as the big tidal current challenge occurs at the end and is often critical to whether swims are completed. That’s 15 records subsequent to Captain Webb’s first swim, regardless of distance with Peggy Lee Dean’s 1978 record as the first sub-8 hour swim, and any swim under 10 hours is still considered a very fast swim, and 10 to 12 hours is also still considered fast. The past four records have seen a time reduction of 22 minutes, similar to each improvement in most of the previous records after Georges Michel in 1926. Below is a chart of the reducing times, flattening all the time as the ultimate time comes closer. 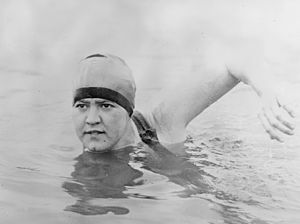 It’s important to note that the third Soloist, (and subsequently the world’s most famous athlete of the time), Gertrude Ederle, was the first to swim what we now recognise as front crawl, which all subsequent record holders have used and the slope of decreasing times after her swim is shallower. 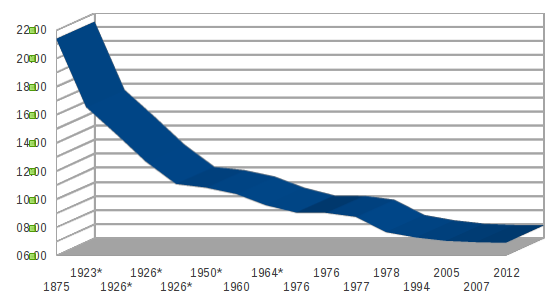 It should be readily obvious, given that the five recent records were all set by swimmers considered amongst the world’s fastest, and four of them as professionals, that any further improvements will incremental rather than large and I’ve therefore set the minimum time on the chart at six hours.. I’ve already written at some length about swimming on bow and displacement waves. I’ve already written that every Channel swim is assisted to some extent, purely by virtue of the presence of a pilot boat which provides wind shelter, so there no need to rehash that ground. In MIMS, there has apparently been some substantial computer modelling of the currents to produce a theoretical maximum possible. This is not currently possible for the English Channel, or at least for it to be possible, one would need a lot more data measurement points, i.e. buoys, in the Channel, which would interfere with shipping, to no significant advantage. The August edition of H2Open magazine had an article on Petar Stoychev’s English Channel record, including an interview from Mike Oram, and David and Evelyn had a copy in Varne Ridge, which we all read in the days before Alan and Trent’s swims. Mike had pointed out that Stoychev had had “a perfect day for a record” (starting with a “brisk north-westerly” which they surfed out which later “swung south-south-west to slow up the tide”). He’d also already done one of the fastest ever Channel swims and so was familiar with the Channel, and he had the psychological advantage of a virtual race with Russian Yuri Kudinov who was attempting a Channel record the same day. In fact Mike Oram said it was “the fact that both swam on the same day and within such a short time gap that pushed them both to their limits – and a bit beyond. This is what records are made from“. Earlier in the week, Mike allegedly said to Trent, (I wasn’t there), “it was a one-in-ten-years day”. Sylvain Estadieu, Channel swimmer and Sandycove swimmer-at-large asked on the Channel Chat Group what Mike Oram thought the best time could be. For the sake of this I’ll assume readers are not on that group (mostly, nothing happens there). “With Trent and Petar braking [sic] the record was really down to the weather and sea conditions. Trent had better weather on the day although it was not what was forecast or what we expected would last long enough for a record crossing. The gentle North Westerly gave Trent the advantage of a small surfing sea that enabled him to building up a 7 minute lead over the first 3 hours. He then held Petar’s swim pace for an hour or so before starting to slow and fall back in the 5th hour. From then on it was touch and go as the seconds were lost. Things changed when Petar’s phone calls helped to motivate him and luckily for Trent the weather just kept on improving. A late boost in the tidal flow also helped him towards the point at the Northern tip of Cap Gris Nez where his landing and clearing of the water was clean and quick. Petar lost about 1.5 to 2 minutes getting up onto the rocks as he did not follow our instructions and go for the right landing place when we reached Cap Gris Nez”. The most relevant part is that Mike, one of the most experienced current pilots, estimates the possible record time as 6 hours 20 minutes. What I can say about Trent’s swim, is that he probably could have benefited from an earlier start. After all the discussion about optimum start time during the briefing, when Mike outlined the different start time options, the actual swim time was almost 6.45 a.m. when Mike had said the “on the edge” best start time was 6.30 a.m.
As tides go, Trent wasn’t on the lowest neap of the year. A lower neap would mean slightly less tidal current, though it’s doubtful this would translate to more than a couple a minutes. On the other side, as Mike points out, a fast enough swimmer willingly to risk the highest spring tide of the season could benefit from the stronger currents on the French side of the Strait. Weather-wise Trent has quite calm day, but with a couple hours of increase Force Two chop. There is always a difference between a completely flat “glass” sea and a stronger tail-wind and surfing sea. I asked Trent which he preferred and he said he felt he was faster with a surfing sea. Which is better, a one-day-in-ten perfect glass or a wind that lines up behind the swimmer and shifts north-westerly. I feel the wind was not entirely as Mike said, it seemed South-westerly to me, and I noted the direction and speed specifically at about the fourth hour, when Mike notes that Trent was losing speed. During that hour he lost the wake regularly. That may have translated in the most accumulated loss. Owen and I estimated Trent’s total feed time at 112 seconds. Stoychev’s was about 90 seconds. At those speeds every ten seconds lost doesn’t equate to 10 minutes swimming, but 20 seconds lost could very easily mean four or five minutes lost. And at the rate he was swimming, sacrificing two second for another feed in the last 40 minutes might have also been beneficial. In my non-expert view compared to Mike Oram, I’d estimated that Trent could go fifteen minutes faster. Of course that doesn’t mean he will because that weather and tide combination is elusive for everyone. But I wouldn’t rule it out. I can’t quantify Mike’s assertion that the record could be improved by thirty minutes, but I can’t rule it out either. And the Channel teaches people to be careful of using the word “impossible”.